As part of a my ongoing consulting gig, I often run painfully long queries on SQL Server to fetch data. This data obviously ends up in Excel for further analysis. Now, some of these queries return NULL values in several columns (did I tell you that the queries have a gazillion left joins on them, oh yeah, they do). Although technically NULL is nothing, when you import this data to Excel, we get the text value NULL in the cells. And I don’t need these NULL values messing up all the calculations and pivots. Of course, we can go ahead and use the isnull() SQL function to deal with them at the query level. But since the queries have 100s of columns and used by various teams for different purposes, changing them causes a lot of pain. So I did what any sensible Excel user would do. 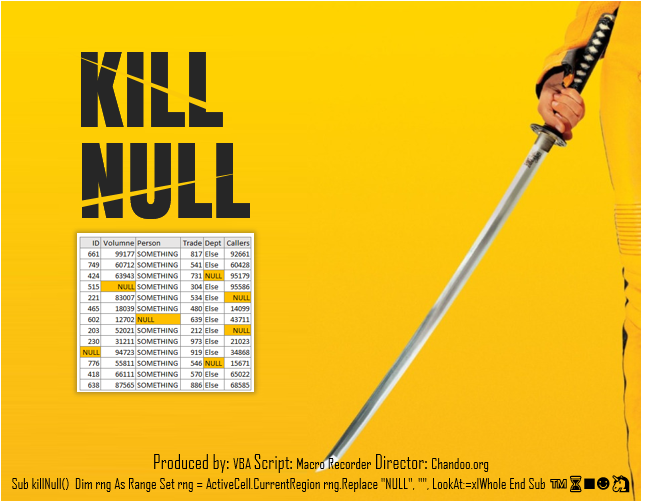 Just kill those NULLs mercilessly once they are in Excel. In this installment of spreadcheats we will learn how to understand excel formula errors and fix them. The #DIV/0!, #NAME?, #N/A, #NULL!, #NUM!, #REF!, #VALUE! errors and how to fix them.